^ 1.0 1.1 Egoli definition and meaning. Collins English Dictionary. [17 July 2018] （英语）. ^ Johannesburg (South Africa). Crwflags.com. [9 December 2010]. ^ Chronological order of town establishment in South Africa based on Floyd (1960:20–26) (PDF): xlv–lii. ^ 4.0 4.1 4.2 4.3 Main Place Johannesburg. Census 2011. ^ Gauteng's Human Development Index (PDF). Gauteng City-Region Observatory: 1. 2013 [1 January 2015]. （原始内容 (PDF)存档于11 January 2015）. ^ Th. Brinkhoff. Principal Agglomerations of the World. Citypopulation.de. 23 January 2010 [2 July 2010]. ^ Johannesburg. [25 May 2015]. ^ City of Johannesburg. Statistics by Place, Metropolitan Municipality. Statistics South Africa. [17 April 2015]. ^ Thomas Brinkhoff. South Africa: Provinces and Major Urban Areas. City Population. 15 September 2014 [17 April 2015]. ^ Ritchie, Kevin. A jubilee that truly sparkles. IOL. 2 July 2012. ^ Johannesburg, South Africa (1886-- ) - The Black Past: Remembered and Reclaimed. blackpast.org. [30 November 2015]. ^ The State of African Cities 2014. United Nations Human Settlements Programme. [October 2014]. ISBN 978-92-1-132598-0. （原始内容存档于2014-09-10）. ^ Statistics by Place: City of Johannesburg. Statistics South Africa. [October 2014]. 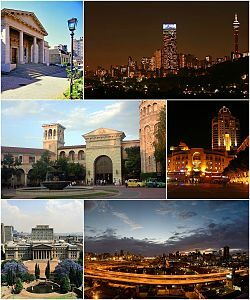 ^ 18.0 18.1 18.2 18.3 18.4 18.5 18.6 18.7 18.8 city of Johannesburg - Making Joburg an entry point into Africa. joburg.org.za. [30 November 2015]. （原始内容存档于2014年2月1日）.